Hey, mister. I am mad scientist. It so cool! Sonuvabitch. Your doom is nigh! 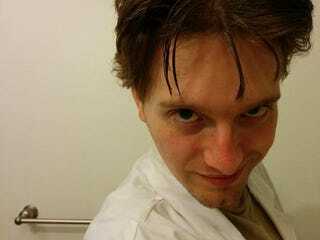 Let all who disregard the sanctity of science quake in terror before the mad genius of Hououin Kyouma! MUAHAHAHAHA! So after considering a few other possibilities for a Halloween costume decided to just reprise what I did last year. Part of the reason was just that it was simpler than choosing and purchasing a new costume. But also I genuinely enjoyed taking on the mantle of Okabe Rintarou last year and was more than happy to do so once again. Plus, I've been playing the original Steins;Gate game recently, so I've had plenty of time to get inside Okabe's head again. For those who are not in the know, Okabe Rintarou is the main character of Steins;Gate, a visual novel about time travel (and romance) which was later adapted into an anime by White Fox (as well as a play). Okabe fancies himself a mad scientist and goes by the name Hououin Kyouma in public, declaring himself a rogue genius on the run from the nefarious (and completely nonexistent) Organization which controls the world from behind the scenes. At heart though, Okabe's actually a pretty sensitive nerd who covers up his lack of confidence and social skills with his alter ego. Anyhow, in high school I was prone to similar declarations of grandiosity and for this reason, and a couple of others, I identity more than a little with Okabe (though he's much more committed to the act than I ever was). Anybody else dress up for Halloween? I know we're all a bit old for trick or treating, but I know there's some pretty talented cosplayers on the Deck and I'd be interested to hear what you got up to (if you feel up for sharing of course! ).